About a year before the Tiger Woods scandal, the billion-dollar golfer began a quest in Dubai to create a luxurious oasis complete with villas, mansions, palaces, a boutique hotel and an unrivaled golf course, "Al Ruwaya" or "Serenity." Recently, it was reported that "Tiger Woods Dubai" has turned into a deserted "dust-bowl", except for the million gallons of water piped in each month to keep the six holes alive. In 2008, Woods defended his decision to create his first ever championship golf course in Dubai stating, "Dubai is basically in the biggest, greatest and newest of everything." According to the Observer, the economic boom is over and the "property-based economy in Dubai has collapsed". If this is the case, why are the Michael Jackson Islands being proposed as a new project in Dubai? Yes, I said the Jackson Islands. "With a size of 10 by 15km, the islands are formed after the lines of Michael Jackson’s face. His face, an enclosed bay, is turning towards the continent. Unlike all the other islands in Dubai, these ones are artificial hills, reaching a peak of 3,776 metres (the height of the Fuji Mount)." Since 2009, Tiger has not commented on his first project except to say, "The economy needs to turn around...It's out of my hands." The telephone there is long disconnected, the furniture is covered with dust. For all intents and purposes, Tiger Woods' first project is a bust. The Cliffs at High Carolina and Punta Brava, Woods' second and third foray into golf course design, still plan to open in 2012. In spite of economic woes, loss of endorsements and even personal divorce woes, the Dubai Properties Group website remains open for business, ready to sell the Tiger Woods dream destination to those willing to plunk down the millions required for "the most exclusive and luxurious homes ever built in Dubai." Golf Channel Instructor Search Finalists includes a real Player! Golf Channel announced today that it has narrowed its nationwide search for the network’s next instructional star to three finalists, and one's a real Player! Wayne Player (Tequesta, Fla.) Son of golf legend Gary Player, Wayne and his father Gary were the first father-son duo to compete in both a U.S. Open and an Open Championship at the same time. Today, he is best known for his tailored entertainment and travel experiences for corporate and private clients, sharing life lessons on and off the golf course he learned from his father. He has worked in-tandem with several of the game’s top instructors, including David Leadbetter, Bob Toski and Peter Kostis. Martin Hall (West Palm Beach, Fla.) Ranked 12th on Golf Digest’s Top 50 Teachers of all time and ranked as a GOLF Magazine Top 100 instructor, Hall is no stranger to Golf Channel viewers. He has been a frequent contributor to the network’s instruction shows including Academy Live, and is a featured instructor on GolfChannel.com. Hall was 2008 PGA of America Teacher of the Year, is a contributing writer for GOLF Magazine and was longtime teacher for LPGA Tour professional Morgan Pressel. Karen Palacios-Jansen (Mooresville, N.C.) Named as one of Golf Digest Woman’s Top 50 Women Teachers every year since 1998, Palacios-Jansen is a certified personal trainer who incorporates fitness training into her teaching. A former David Leadbetter trained instructor and Jim McLean Golf School master instructor, she was named 2008 LPGA Teacher of the Year and has been teaching golf for 17 years. She currently is managing editor for Golf Fitness Magazine, and is married to Olympic Gold Medalist Dan Jansen. The three finalists were selected from a nationwide search conducted by Golf Channel this fall – all hoping to host their own instructional series on the network. Each of the finalists will host a half-hour instruction show as part of the network’s 12 Nights at the Academy series of instruction specials, airing Nov. 29-Dec. 10 at 7 p.m. ET. The finalists’ shows will air Nov. 30 (Hall); Dec. 5 (Palacios-Jansen) and Dec. 7 (Player). Viewers have the opportunity to view the finalists’ audition video and video tips online at www.GolfChannel.com/InstructorSearch. Viewers also are encouraged to participate in the selection process by voting online through Dec. 15. The winner is expected to be announced on Golf Central in January, with the new show scheduled to premiere early in the year. Follow Golf4Beginners on Twitter and Voice Your Opinion! Is the new Adidas aG Strike Golf Bag a stand-out? Considered the "hero" of the 2011 Adidas Golf Bag Collection, the aG Strike Stand Bag is lightweight and durable, loaded with basic comforts and thoughtful details which will please even the most demanding golfer. I really put this golf bag through its paces (sorry Adidas) hoisting it in and out of my car with the help of the easy-grip handle, but unfortunately it collided bottom first onto the ground a few times. I tried to be gentle with my new stand bag but happy that Adidas had me in mind when they constructed the aG Stand Bag with double-stitched seams and strong binding on the base cuff of the bag. The sturdy non-slip rubber grips on the bottom of the arms and the crush-resistance of the bag are also appreciated! From a woman's perspective, the lighter weight (4.3 lbs) and not-too bulky anti-fatigue straps really make a difference carrying the bag as well as putting it on/taking it off during the round. The six-way compressed nylon top, four-way full-length dividers were useful in minimizing contact between my clubs although I found that, when my round goes awry, I don't really pay much attention where that 7-iron goes...one of my mental errors which I am constantly working to improve! Colorful and stylish, the new Adidas aG Strike Golf Bag will not disappoint the golf fashionista! Although my choice of color was the red/charcoal/gray combo (red for the Tiger Woods in me), there are other great combinations to match your outfits (and your grips): Black/Charcoal/Blue, Black/White. There are also external slots for pen and umbrella, an insulated water bottle sleeve, an in-pocket hook for your keys, large pocket for your sweater when the temperature rises and even pull cords for every zipper making it easy to open and close each pocket. Seven pockets in total with plenty of places to store your golf accessories including a velour-lined space for your valuables. Speaking of pocket fillers, the folks at Adidas Golf were really thinking of the consumer when they came up with the new FAS-TEK system (Fast Action Snap Technology.) Instead of fumbling through your pants pockets searching for GPS and/or cell phone, you can attach your goodies directly to the golf bag and have your GPS at your fingertips! Although sold separately, this is one innovative way that Adidas can help you "trick-out" your golf bag. One of the niftiest items attached to my new Adidas aG Strike Stand Bag, in my opinion, is a ball marker with cut-outs of a star, line and circle. Several smiley faces adorn my golf ball so, as you can see, this added touch on the Adidas golf bag caught the eye of this female golfer! Of course the Adidas Golf aG Strike Stand Bag is a stand-out for the most discerning male or female golf enthusiast and, believe me when I say, women make the toughest critics! Read more golf blogs on Golf for Beginners! The readers of GolfStyles New Jersey magazine have just voted Forsgate Golf and Country Club the “No. 1 Private Club Value” and the “No. 1 Family Club” in its 2010 Readers’ Choice Awards. Forsgate also claimed top-ten spots in the categories of “Best Private Golf Course” and “Best Restaurant,” among others. GolfStyles polled more than 47,000 of its Garden State, New Jersey readers for the fall 2010 awards issue. I am very proud of Forsgate but not surprised. Once a year, local golf writers are invited to play the "Writer's Cup" on the Banks Course. The natural beauty of the golf course coupled with the delightful service of the staff truly makes Forsgate Country Club a winner in my book! Oh, and I cannot forget the delicious lobster! Forsgate also offers The Palmer Course, an 18-hole traditional American design that is highlighted by water on ten of its scenic holes. To accompany its award-winning golf, Forsgate boasts a first-class golf staff. The club’s Director of Golf Carolyn McKenzie Andrews has been named one of the “Top-50 Kids Teachers in the United States,” while assistant golf professionals Scott Barnaby, Mark Mazzola and former PGA TOUR pro Bobby Gage are among the area’s most sought-after instructors. Bobby Gage is great at giving easy-to-understand golf tips, using the basics and imagery to ingrain proper technique, as I learned during our recent outing at Forsgate CC. Forsgate Golf and Country Club is also committed to helping local charities, raising over $200,000 since 2003 for worthwhile causes! Recently Forsgate hosted a golf skins and skills game with Annika Sorenstam and J.B. Holmes. Interested in becoming a member at Forsgate Country Club? Call Director of Membership Carol Rutherford at (732) 656-8914. Forsgate is an exclusive, full service, family-oriented private country club located in the heart of New Jersey. Forsgate offers permanent golf, sports and social memberships for individuals, families and corporations. Established in 1931, Forsgate Country Club features 36 holes of world-class golf, including the renowned Banks Course, designed to recreate historic holes throughout Europe, and the Palmer Course, which is a traditional American course with challenging water hazards on ten of its scenic holes. The country club also offers facilities for banquet events and corporate meetings as well as a new state-of-the-art sports complex that includes a fitness center, pool and cabana cafe. Forsgate Country Club, which is located midway between New York City and Philadelphia at Exit 8A of the NJ Turnpike, is owned and operated by RDC Golf Group, Inc. Founded in 1993, RDC has rapidly become a recognized industry leader in golf course ownership and management whose properties have garnered numerous golf course and hospitality awards. RDC owns and operates the renowned Forsgate Country Club in Monroe Township, New Jersey, and the private, family-oriented Tuscawilla Country Club in Orlando, Florida. RDC currently manages the award-winning Tallgrass Country Club in Shoreham, New York and the public Putnam National Golf Club in Mahopac, New York. Yas Links Abu Dhabi, the new Kyle Phillips designed golf course which debuts at IGTM this week, is the “best course in the Middle East” according to the latest issue of Golf Course Architecture magazine. The world-class development on Yas Island, home to the Yas Marina Formula One Circuit, venue of the season ending Abu Dhabi Grand Prix, and the spectacular Ferrari World, the world’s largest indoor theme park, has received widespread critical acclaim. It is the first Middle East design for leading course architect Kyle Phillips, creator of World Top 100 Course Kingsbarns, Scotland, as well as the highly rated Verdura Golf & Spa Resort (Sicily), Dundonald (Scotland), and The Grove (London), who has created an extraordinary links overlooking the Arabian Gulf that rides rolling sand hills along three kilometers of coastline, and features nine seashore greens. In a unique twist, Phillips was able to design not only the golf course, but the coastline along which the course runs. That’s because the channel along the western edge of Yas Island had to be dredged to produce the 1.8 million m3 (cubic metres) of fill used to construct the golf course. The result is a coastline that lends itself perfectly to exciting golf holes, and one that is also benefiting from an approved environmental program that has introduced 130,000 mangrove plants. Yas Links General Manager, Chris White, said: “Kyle has created a breathtaking golf experience at Yas Links and one that is unique in the Middle East. It is a rolling, heaving golf course, weaving through sand hills and wending its way along the shoreline with views of the Arabian Gulf on all 18 holes. Yas Links is peppered with 119 bunkers, while Paspalum Platinum links grass covers the sand hills and defines the fairways of the 7,414-yard, par-72 course, which has five different tee settings to make the course challenging from the Championship tees, while creating an enjoyable experience for members and visitors. Yas Links is part of Aldar Properties’ Yas Island development, a global leisure destination. Golf facilities at Yas Links also include a 5,750 m2 (57,000 ft2) luxury clubhouse and world-class, floodlit practice ranges and golf academy. Some of the world’s top golfers will experience Yas Links for themselves in 2011 when the world’s most prestigious one-day Pro-Am tournament moves to Abu Dhabi. The Invitational on January 17, 2011, hosted by Abdullah Al Naboodah, will see some of the world’s best European Tour golfers join forces with fifty invited amateurs for a day of great competitive golf. World No.1 Lee Westwood, reigning US Open Champion Graeme McDowell, Rory McIlroy, Paul Casey, Sergio Garcia and Ross Fisher plus many more are expected to attend. Has European Tour golf won out over the PGA Tour? In what is considered by some to be a snub to America, Rory McIlroy recently declined PGA Tour membership for the upcoming 2011 season joining Martin Kaymer and Lee Westwood as staunch supporters of the European Tour. Both Westwood and McIlroy have voiced concerns about a long PGA Tour schedule with few breaks in between events and the idea that their golf careers should not be solely about money. The PGA Tour further ostracized Euro Tour golfers recently with its offer of a three-year exemption to the winner of a WGC event in China only if that golfer is a member of an American Tour! Is money even a consideration for the two Euro Tour golfers, now atop the money list, or have they become sated and more interested in enjoying a less grueling schedule? With many of the top competitors now in Europe (seven Euro Tour players won eight 2010 PGA Tour events) and purses growing, it makes sense for many Euro Tour golfers to support their own events. As a note, career earnings for Lee Westwood to date on the PGA Tour (from Yahoo! Sports) is a staggering $28.5 million dollars. Rory McIlroy's career earnings are a more conservative $8 million to date with $2 million won this year as a result of his win at the Quail Hollow Championship. I agree with McIlroy that money can't buy happiness, but it can offer a comfortable lifestyle for you and your family! That being said, with the European Tour requirement to compete in thirteen events in 2011 and the PGA Tour needing fifteen events in order to retain a card, both Tours are forcing a choice to be made by the golfers, and more professional golfers are leaning towards the European Tour. Ian Poulter is torn between keeping his PGA and Euro Tour cards, "I have a house over in the States and my family is well settled over there, but then you can't deny playing two tours is becoming increasingly difficult, especially with the European Tour number you have to play going up." Graeme McDowell, winner of the 2010 U.S. Open, is expected to join the PGA Tour in 2011 to "give it a go" but has also expressed concern about the FedEx Cup playoff schedule. "I'd like to try the FedEx[Cup] Playoffs, although I wasn't particularly impressed by the format this year. ... But I certainly do want to go out and play a little bit more golf out there." McDowell attempted to join the PGA Tour after his win at the U.S. Open but didn't qualify, finishing 197th in points. If the winner of the U.S. Open can't qualify for a PGA Tour card, perhaps that is yet another signal for Europeans to back away from the the tour. Even Phil Mickelson has decided to play his first event of 2011 out of the States in January at the Abu Dhabi Championship. But, I think for Phil the enticement IS the money and the chance to get out of playing at the five-day Bob Hope event. Perhaps it's time for the PGA and Euro Tours to join forces, tightening up both entities but maintaining their distinct identities. Golfers seem to want to play in both Tours but are forced to choose one over the other. Instead, oust tournaments without sponsors, give "crybabies" a rest but make all golfers sign on to certain events so that all tournaments have A, B and C-list players covered. European Tour golfers are speaking up, but its up to the PGA Tour to listen. Joining forces does have its considerations: for one thing, it wouldn't be "Us against Them" Anymore. Where would we be without the Ryder Cup? Here are a few first impressions after opening the box which contained my new Adidas Golf Strike aG Stand Bag. The Adidas Strike aG Stand bag is very light (4.3 lbs) and easily lifted out of the box with the help of the rubber-fingered grip positioned on the rim of the golf club holder. This grip should come in handy as I lift the stand bag in and out of my car. For left-handed people like me, the Strike aG golf Stand Bag comes with the dual-carry strap set up for right-handed golfers (the majority of players) so be prepared for a quick switch-over which took me all of three minutes. I don't think that this picture does the Adidas Golf Strike aG Stand Bag justice! The bright red color coupled with gray and black are a great combination for both men and women golfers. The Adidas Golf Bag comes equipped with Fast Action Snap Technology which basically means that I can connect all of my golf accessories, from smart phone to GPS in a matter of seconds. I see (from the attachment on the Bag) that these accessories can be purchased at a later date but the idea intrigues me as pocket space is dwindling on my khakis! More of a review to follow as I'm switching over my golf clubs to my new Adidas Golf aG Strike Stand Bag later today. 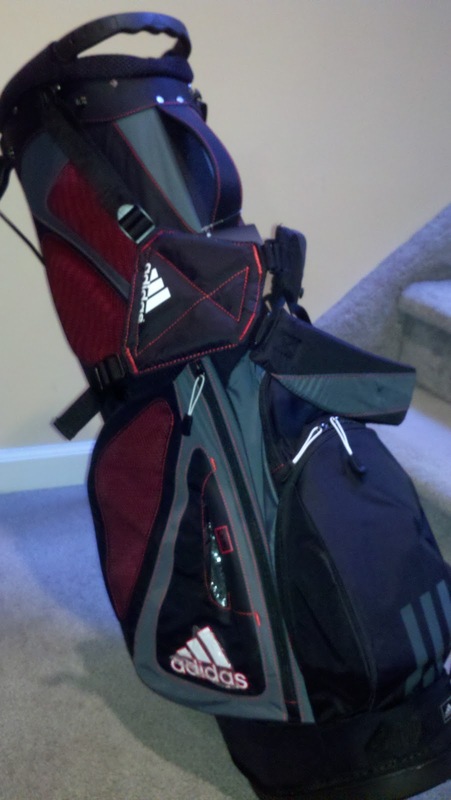 I'll be taking my new golf bag to the course this week if the weather holds out. I need to see that this golf bag isn't just another 'pretty face' but also combines functionality and durability on the golf course! Note: The new 2011 Adidas aG Strike Stand Bag is one in a series of five golf bags in their collection (four stand bags and a cart bag) designed to enhance the golfer's experience on the golf course. Thank you to Adidas Golf for sending me your latest (and perhaps lightest?) stand bag! The day before his 28th birthday, Francesco Molinari put the finishing touches on four days of incredible golf, becoming the first wire-to-wire winner of the WGC-HSBC Champions and emphatically proving that world golf in 2010 belonged almost exclusively to Europe, Tim Maitland reports. For the first time Europe Tour members claimed three of the four WGC titles (Ian Poulter won the WGC-Accenture Match Play Championship and Ernie Els took the WGC-CA Championship) to add to three Majors (Graeme McDowell/US Open, Louis Oosthuizen/Open Championship and Martin Kaymer/PGA Championship) and the small matter of the Ryder Cup at Celtic Manor. “I'm a European Tour Member, I'm proud to be a European Tour golfer, and it's a great moment for European golf and I'm really happy to give my contribution to that,” said Molinari, who also capped an unprecedented year for Italian golf too, by adding his name to that of his brother Edoardo and teenager Matteo Manassero on the season’s list of winners. Positioned first and second each day and separated only by one shot at the close of each round on the further-toughened Sheshan International Golf Club track, Molinari and new world number-one Lee Westwood put on a stunning display throughout. On the final day both shot five-under-par 67s (a score bettered only by Katsumasa Miyamoto), despite being in the pressure-cooker environment of the leading group. Neither had a bogey in their final round, and Westwood’s cards were unblemished throughout the weekend as the two of them left the rest of a world-class field miles behind; Luke Donald and Richie Ramsey tied for third, ten shots adrift of Molinari’s 19-under total of 269. “I think the difference in score between us and the rest of the field shows you how good [sic] we played, and I'm sure it was a great show for everybody who was watching here on TV, as well,” said the Inter Milan fan, who apart from winning the Omega Mission Hills World Cup for Italy with his brother in 2009, was probably best known for being on the wrong end of a Tiger Woods master-class on the final day at Celtic Manor. “I'm obviously amazed the way I played, and you know, to have the number-one player in the world trailing you by one shot, it's not easy. I was under pressure all the time, pretty much from the first round. It's great, not only the way I hit the ball, but the way the mind was working. I managed to stay calm, play my game, and holed putts when I had to hole putts. I think the experience of playing with Tiger Woods in The Ryder Cup definitely helped me in the last couple of days. Obviously they [Woods and Westwood] are different players, but when you are playing against the number-one golfer in the world, it is not easy to always stick to the game plan and do your own game,” Molinari said. For the first time in the history of golf, the world number one ranking was up for grabs at an Asian tournament. Westwood, in defeat, won the four-way battle with Woods, Kaymer and Mickelson. Tiger Woods was sixth on 7-under, Kaymer 30th on minus 2 and Phil Mickelson, twice a Shanghai winner, 41st and one-over par for the tournament. Having arrived at the HSBC Champions as the newly-crowned world number one, ending Tiger’s five-year monopoly of the position, Westwood delivered a display worthy of that ranking and further strengthened his grip on it. As well as Westwood winning the skirmish for the number one ranking, the Englishman proved that he had taken up another of Tiger’s mantles. The world number one has now been in contention in the final holes on the final day of the HSBC Champions three times. Just as Tiger Woods did in 2005 and 2006, in 2010 the world number one also came second. All the other battles within the battle went to Europe too. In the first encounter of the game’s great and good since Celtic Manor four members of the winning Ryder Cup team were in the top five – Molinari, Westwood, Donald and Rory McIlroy. Only one American team member – Woods – made it into the top 20 in Shanghai, against eight of the twelve in the European side. The other winners were the tournament itself and golf in China and Asia. After a successful debut as a WGC event in 2009, 2010 confirmed that the concept of a World Golf Championship event on the other side of the world to golf’s heartlands is a success. Crowds were close to 2009’s record-setting figures with over 31,000 attending the event, and the record-breaking TV coverage increased again, particularly with highlight shows on terrestrial channels in Asia. To put the rise of the HSBC Champions in perspective, two-time US Open champion Retief Goosen struggled to think of another event anywhere in the world during his career that has risen to prominence the way the Shanghai tournament has since its inception in 2005. Thanks to Tim Maitland for a tournament wrap-up of the WGC-HSBC Champions Tournament! 2010 Valero Texas Open winner Adam Scott had been beaten by a girl before, just not by a 12-year-old. Playing the 17th hole of the WGC-HSBC Champions Pro-Am, Scott found the bunker and made bogey. Little Lucy Shi Yuting, a thireteen-time winner in three years on the HSBC National Junior Championship, made par. The significance is twofold, says the writer of this article, Tim Maitland. The other girl to beat Scott was a few years ago and someone called Wie – Michelle Wie – and you can make a note that November 3rd 2010 was the day when the elite of men’s golf truly came to realise that China is coming faster than they realized. “These are the Olympic champions and world champions of the future. They’re fantastic! Fantastic!” raved Europe’s Ryder Cup-winning captain Colin Montgomerie after conducting a clinic with some of the younger children from the HSBC China Junior Golf Program. “They’re proper golfers. They’re not just kids that can hit a golf ball on the range. These are complete golfers at nine years old: driver, putting, and short game!” Monty continued. As Monty was saying those words, Mickelson was coming off the course having also encountered Lucy Shi at the 17th, three days after she beat her rivals by 12 shots over three rounds at the HSBC National Junior Championship final. “She hit a 6‑iron to about 15 feet from the hole, lipped out the putt and made par. She was an incredible player!” said Lefty. Back on the range, Monty was echoing the words of PGA Tour player Jason Dufner who, a year earlier, having done the same clinic exclaimed the Chinese kids he saw were far superior to their equivalent age group in the States. “Oh of course they are! Way ahead! And of course the work ethic here is different. These kids are prepared to put in the hours it takes nowadays to become very, very good. You can see how they love it. They’re all involved. It’s fantastic and the work ethic here is different to ours,” Monty said, adding that the focus of the kids he saw put him to shame. Montgomerie’s comments came as the junior championship was celebrating the one thousandth child to compete in the elite tier of tournaments that have been running since 2007. “A thousand children may not sound like a lot over the four years that we have been investing in the China Golf Association’s programme, but that’s the top of the pyramid,” said Giles Morgan, HSBC Group Head of Sponsorship. “Below the top of that pyramid, we have had 8,000 children who have come through our summer and winter camps, learning the great game of golf, and below that, at the foundation of the pyramid, we have had 200,000 children touching golf for the first time in their schools’ PE lessons through the HSBC Education Program,” Morgan added. Thanks to Tim Maitland for his fascinating insight into China's growing golf program. Golf in China is making it's move: read below to see China's golf history and timeline. 1986 - January. First “international” tournament: Chung Shan hosts the Chung Shan Cup, featuring foreign players but not recognised by any outside sanctioning bodies the Pro-Am event is hailed in China the first international tournament. 1990 - September/October. First big event: The Asian Games golf tournament is held at Beijing Golf Club, Shunyi District. The Asian Games itself was the first large-scale international sports event to be held in the People’s Republic of China. 1994 - October. First medals: At the Asian Games in Hiroshima Zhang Lianwei wins an individual silver medal behind Kaname Yokoo, while China’s women’s team claims bronze. 1994 - April. First professionals: Zheng Wengen and John Xiao Chenghan are among a handful of golfers to become the first Chinese professionals when they pass a newly-introduced CGA exam. 1995 - First domestic tour: The Volvo China Tour, China’s first domestic circuit, consisted of four 36-hole tournaments. 1995 - April. First official international pro tournament: The Volvo China Open in Beijing (Beijing International Golf Club) is won by Raul Fretes of Paraguay. Total prize money was US$400,000. 1997 - April. First Chinese player to win an international tournament: Cheng Jun is victorious at the Volvo China Open in Beijing. 2003 - January. First Chinese win in a European Tour event: Zhang Lianwei wins the co-sanctioned Caltex Masters in Singapore. 2004 - First Chinese player in a Major championship: Zhang Lianwei receives an invitation to the Masters. 2004 - May. First Chinese golf world record: Mission Hills entered into Guinness Book of Records as the world’s largest golf club after its expansion to 180 holes. 2005 - November. First time to host Asia’s leading tournament: With US$5m prize money, the HSBC Champions, then Asia’s richest tournament, debuts in Shanghai. The inaugural tournament is won by English Ryder Cup star David Howell. 2007 - First fully-integrated junior development scheme: The HSBC China Junior Golf Program and HSBC National Junior Championships are launched. 2007 - First Chinese to win Asian Tour’s Order of Merit: Liang Wenchong clinches the title with nine top-ten finishes including a win at the Singapore Masters. 2008 - July. First weekend play in a Major: Liang Wenchong makes the cut at the Open Championship at Royal Birkdale. 2008 - November. First impact on the Official World Rankings: Sergio Garcia moves up to number two after winning the HSBC Champions. It’s the first time an Asian event has had such a profound effect on the global standings. 2009 - April. First Women’s Tour: The China Golf Association announces the birth of the China LPGA Tour. The circuit will have strong links with the Orient Golf chain, playing the majority of the events on their courses. 2009 - Asia’s first WGC event: WGC status is awarded to the HSBC Champions in April, making it indisputably Asia’s single-most important tournament. The event in November features Tiger Woods and Phil Mickelson playing in the same tournament for the first time in Asia. Paired together in the leading group on the final day, Mickelson triumphs. 2010 - First Impact On World Number One: Four players - Lee Westwood, Tiger Woods, Martin Kaymer and Phil Mickelson – arrived in Shanghai for the 2010 WGC-HSBC Champions, knowing a good week would make the number one in the world. No Asian tournament had ever impacted the very top of the Official World Golf Ranking. 20?? : China’s first world number one:?? Addressing China’s emergence into world of golf is not a question of “if”, it’s a question of “how fast?” Tim Maitland reports. There are few definitive truths one can utter about a nation of China’s massive scale. There are, however, some useful generalizations about the “Middle Kingdom” especially in the last ten or twenty years. Firstly, it tends to develop in whatever it is doing far quicker than almost all outside predications. Secondly, China, just as it did with its “socialist market economy”, tends to find its own way. The same broad brush strokes apply for golf. Just as surpassing Japan’s gross domestic product in the second quarter of 2010 confirmed China’s status as an economic power, China’s position as a global tournament host has also been confirmed. It took just one edition of the HSBC Champions as a World Golf Championships event to complete a process started by the Volvo China Open, the first truly international Chinese professional event in 1995, to convince most of the naysayers that Shanghai was going to work. One of the little asterisks – whether it should count as an official PGA Tour win - was quickly removed, and this year it did… for the tour’s existing members at least. “The Chinese economy is probably the strongest economy in the world right now, it’s a good tournament...and it’s a great golf course; that’s really all you can ask for,” Westwood said. The point seems to have been taken on board across the board in America, where the credit crunch closed courses and the stagnation in terms of the numbers of golfers is increasingly being seen as a decline. Couple that with the fact that a very American golfer like Nick Watney currently sports the logos of Japanese luxury carmaker Lexus and German fashion brand Hugo Boss and you’re dealing with a very different, worldly generation of American players. “The markets here and in Europe aren’t growing and are maybe even shrinking. I kind of figured that the way that China was going economically and technologically I thought that golf would follow, but it seemed to happen very quickly,” said Watney, sounding convincingly like a CEO himself. A roll of honour that working backwards from 2009 goes Mickelson-Garcia-Mickelson-Yang would seem to illustrate Watney’s point rather well. The addition of the PGA Tour’s first foray into South East Asia (the limited field CIMB Asia Pacific Classic took place at The Mines Resort in Malaysia the week before Shanghai) is further indication that China’s place on the world-class calendar is beyond reproach. It also signals that the battle for position either side of the first week of November is truly on with the Barclays Singapore Open competing with the JB Were (Australian) Masters as the quality of field across the region skyrockets. That the number of golf courses in China will continue to grow as well is also beyond doubt. Despite a long-standing moratorium at central government level making permission for new layouts harder to get, China has found a Chinese solution and, loathe as one is to make broad sweeping statements, many of the world’s top golf course designers are there and they’re not there on holiday. The question now is how? To understand the way golf is evolving in China it helps to think of golf as a feature, like an elaborate marble fountain; a centerpiece to a real estate lifestyle business. That will only continue; Imperial Springs near Guangzhou, which is close to completion, will make all the palatial developments that have preceded it look, in comparison, for want of a better word… a bit Caddyshack. Among the more promising developments for those of us who can’t let go of our western concepts of “sport” being something more in a Corinthian way, isn’t the massive new Mission Hills project on Hainan Island, although that points the way to where the world’s next big tourist magnet will be, but the low-grade locally-designed tracks that form a part of the equally enormous but little-known Nanshan International Golf Club in Shandong province. It is also worth remembering that virtually all of the members clubs allow daily-fee golf and that as China’s middle class grows wealthier the sport is going to become more affordable to them. However, arguing that golf in China needs to trickle down the societal layers to reach the masses before we can address the next question – where China’s stars are going to come from – is made redundant by Korea’s example. The Land of the Morning Calm has produced if not one of the greatest generations, certainly the single greatest year group of women golfers the world has ever seen without them ever seeing golf courses regularly. Shin Ji-Yai, Kim In-Kyung, Choi Na-Yeon – the so-called “Dragon Ladies” – honed their games on the top tier of Korea’s multi-story urban driving ranges not on the drastically expensive, tee-off-at-5 a.m.-oversubscribed golf courses. As well as proving that access to courses isn’t critical, Korea also provides possibly the greatest wisdom when it comes to answering where the future China’s Tiger Woods, Mickelson, Wie or Miyazato is going to emerge from. For the sake of finding a fancy name for it, we could call it the “Shin-Park paradigm” after two of Korea’s most recent women’s Major winners, Shin Ji-Yai and Park In-Bee. Ji-Yai grew up as a golfer in Korea, winning on the KLPGA as a high-school student in 2005. In-Bee went to the States at the age of twelve to do her growing there. The answer to the Shin-Park puzzle in China is probably both. The clues, when it comes to looking into the future, ironically, won’t be found during the week of the WGC-HSBC Champions but the week before. That’s when the year-long HSBC National Junior Championship had its own version of the Champions – a winners-only finale at the Sino-Bay Country Sports Club located in the Shanghai Chemical Industry Park outside Shanghai. In its fourth year, the HSBC National Junior Championship passed a notable landmark; the entry list at Sino-Bay took the number of children to have benefited from an early taste of tournament golf past one thousand! The HSBC China Junior Golf Program has now introduced over eight thousand children to the sport through its summer and winter camps and 200,000 children have swung a club for the first time through the schools scheme which introduces golf into the PE curriculum at primary and middle schools. If you’re asking yourself whether China’s fledgling golf industry – remembering that the first modern course only opened in 1984 – is mature enough to grow future champions yet, it’s worth heeding the reaction of PGA Tour pro Jason Dufner after he’d given a clinic for some of the younger juniors before last year’s WGC-HSBC Champions. “The basics were unbelievable. Some of them were a little limited because of their size but I think where their age range is it was pretty incredible for what they were doing, from what I’ve seen,” Dufner said, comparing the 10-12-year-old kids he saw favourably with their American counterparts. A more cautionary note was sounded recently by Asian Tour Executive Chairman Kyi Hla Han who questioned whether the tournament structure was in place to grow China’s male professionals. Han might have a point, but reports of his comments also failed to acknowledge the existence of the China PGA Tour as a successor to the Omega China Tour, which is far less visible than its predecessor outside of the Chinese language and, at the time of writing, the number of professional men’s tournaments in China in 2010 looked likely to match those of the previous two seasons. The probability is that the women will come before the men, or, remembering how Jenny Feng Shanshan came from nowhere as a teenager to earn her LPGA card, the girls will come before the boys. The reality is, for every Matteo Manassero, Rory McIlroy and Ryo Ishikwawa, there are many more young female golfers who have proved competitive at an early age at the pinnacle of the women’s game. The domestic tour – the China LPGA – is in its second year and aims at staging ten tournaments annually: Zhang Na’s four wins on the Japan LPGA in 2007 have established an alternative roadmap to the American route. It’s already been suggested that the girls’ work ethic exceeds that of the Chinese boys by one high-profile overseas coach. And while one makes generalizations with trepidation, perhaps also the Asian serenity, what long-time LPGA caddie Shaun Clews refers to as a “certain calmness” that the Korean stars benefit from, will also serve the Chinese girls too. Whether it will be the regular winners on the HSBC National Junior Championship (girls like Apple Yang Jiaxin, Lu Yue or, of the younger ones, Lucy Shi Yuting and boys like Zhang Jin or Zhou Tian) or those following the Park In-Bee route (Cindy Feng Yueer and the unrelated Feng Simin are both prominent on the American junior circuit) or one of the young men going through the US Colleges (Hu Mu, Wang Minghao or Han Ren) that will arrive first, only time will tell. Simin, originally from Beijing, is already an AJGA Rolex All-American while Yueer, from the city of Shenzhen in China’s golfing heartland Guangdong province, rates in the top on Golfweek’s junior ranking despite being a couple of years younger than her rivals, but then as a counterpoint Feng Shanshan was hardly on anyone’s radar outside Guangzhou when she went to the LPGA’s Q School. Lucy Shi, at the tender age of 12, looks like a carbon copy of Shin Ji-Yai when she was still a teenager, and although a lot can go wrong in the next six years, Shi looks more likely to star rather than just feature on the LPGA. The reality is that all these players are going to get greater opportunities because of golf’s entry to the Olympics in 2016. Olympic status has moved the China Golf Association from a cul-de-sac (it was until a couple of years ago lumped in with and effectively financially supporting sports like cricket and snooker in the so-called “small ball” section) onto the six-lane superhighway of China’s sports ministry, The State General Administration of Sports. Sweden’s Henrik Stenson, who might not claim to be a China “expert”, might have hit the nail on the head with his broad, sweeping statement about the future of Chinese golf. So the answer when you ask whether China is coming is an emphatic "yes!" The question that remains is just where from, how many and how fast?